Happy first day of Spring! Brush away the cobwebs and open your mind to the possibilities from trying a new quilting technique. For me, it was sampling Kimono Silk Thread by Superior Threads with a few heirloom machine quilting tips from Joanie Zeier Poole. Free-motion heirloom quilting sample (approximately 6" x 6"). Kimono Silk Thread and wool batting. Susan Hyder over at Hyderhangout Quilt Fabric and More asked me if I would be interested in teaching this project through her Superior University monthly program. (Free-motion quilting… silk thread… how could I not???) Absolutely! and I will be presenting it as a guest teacher for a Superior U workshop at Hyderhangout next month on Tuesday, April 1. Call Susan at (423) 715-2908 to reserve your kit. Yes, you get everything you need to make this project—fabrics, batting, pattern and silk thread! 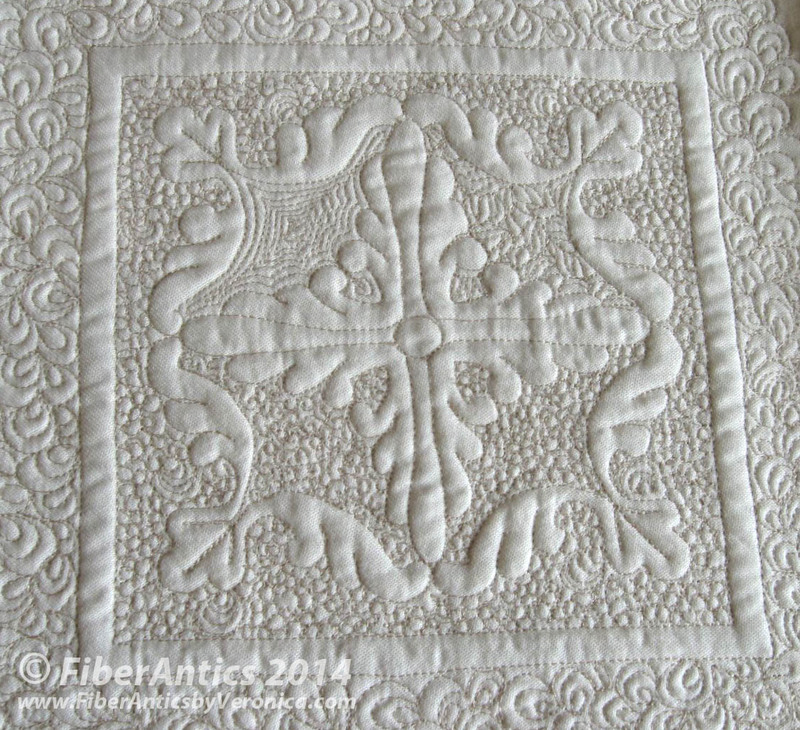 The silk thread was a dream to work with and the sample quilted up beautifully. This 100 wt. thread is excellent for small, tight background fills and stippling—providing a luscious texture without thread build-up. I usually use 60 wt. Bottom Line by Superior (a poly) for stippling and the silk is just as wonderful... it also feels a little exotic to be quilting with silk. Joanie recommends using Bottom Line in the bobbin, which I did. The wool batting and cotton sateen also elevated this quilting experience. It was a new adventure for me to try heirloom wholecloth quilting using a design that I marked on the quilt top. My usual free-motion quilting is more intuitive and spontaneous with no or minimal marking. So, if you're interested in experimenting with silk thread and wool batting with your free-motion quilting, come and join me on April 1. Diane Gaudynski (the Queen of free-motion quilting on a domestic sewing machine! ), Joanie Zeier Poole, Gina Perkes and other quilting gurus use silk thread for their machine quilting—come and see for yourself what it's all about.